a new one which was delivered few days back only..
taken in a hurry..But the taste was heavenly..
Preheat the oven to 350 F.Butter and dust two 8 " round pans. Sift together flour , cocoa , baking soda , baking powder and salt. Beat butter and sugar in a medium speed for 3 min or until soft and creamy. Add eggs one by one beating for 1 min after each addition. Beat in vanilla . Add the melted chocolate. Add the dry ingredients alternately with the butter milk. On low speed mix in the boiling water and stir in the choco chips if you use. Divide the batter evenly in two pans .Bake for 25 - 30 min. Cool the pan in the wire racks .When the cake reaches the room temperature slice each layer horizontally in haf . Set 3 layers aside and crumble the fourth layer. Put the sugar , cream of tartar and water in a small sauce pan . Bring the mixture to boil over medium heat , cover the pan and boil for 3 min. The syrup should reach 242 F or soft ball consistency. While the syrup is cooking start beating the egg whites.When it reaches the shiny peaks slowly pour the hot syrup over the egg mixture. Add vanilla extract and keep beating until it reaches room temperature . The result will be smooth , shiny frosting. Put a bottom layer cut side up . Cover the layer generously with frosting. Top with second layer , cut side up and frost it . Finish with the third layer cut side down and frost the sides and top of the cake. 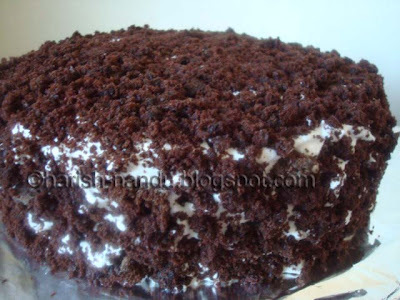 Cover the entire cake with chocolate cake crumbs, gently pressing the cake into the filling with fingers. 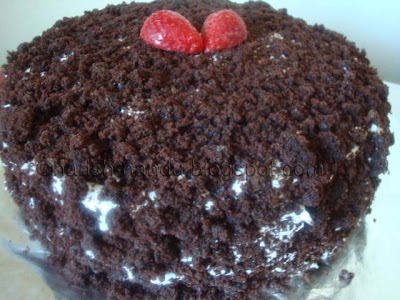 Refrigerate the cake for about 1 hour before serving. are covered entirely by the crumbs. Hope you enjoyed Pongal. Kamala. I came back on the first week of Jan. and been busy ever since. Good to see you back too. Beautiful cake there! Welcome back! The cake looks great. Nice and moist. Good to see you Kamala... Cake looks awesome. Welcome back, cake looks greattttt and yummmm!!! Nice to see you back Kamala...Cake looks delicious..